OMRON M3 is a barometer of the arm, which has many different features that will facilitate the measurement of pressure and you also get a better overview of their health. Thanks to Easy cuff no longer have to struggle with her mount, it can simply be stretched and additionally has a diameter of 22-42 cm, so it really fits everyone. OMRON M3 is a pressure meter for the arm, which has many different features that will help you to read your pressure measurements easier and you get a better overview of your health. With the easy cuff, you no longer have to struggle with the fastening, it can simply be stretched and fitted on your arm. It has a diameter of 22-42 cm so that it really fits everyone. Omron tonometer is equipped with a large, clear three line display for your better orientation. Additionally, it always performs two measurements - when inflating and deflating the cuffs, so that you can be sure that the results are absolutely accurate. In addition, the device can calculate the mean blood pressure, so it gives an objective result even during fluctuating blood pressure. 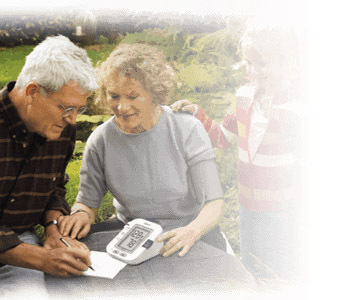 Get a complete overview of all your family members blood pressure. There is no need for the results to be written down, it stays in the Omron pressure meter memory for you. Just measure the pressure and the rest will take care of itself. The Omron pressure meter can remember up to sixty measurement results simultaneously for two people. 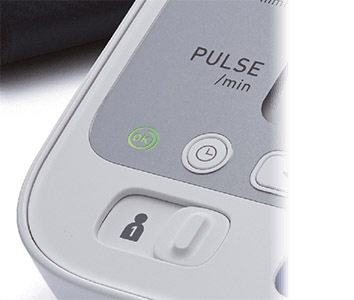 For shipping to other EU countries visit this page OMRON M3 with colour hypertension indicator. Für Versand nach Deutschland, besuchen Sie bitte OMRON M3 mit Bluthochdruck-Farbindikator. Chcete doručit zboží do Česka? Prohlédněte si OMRON M3 s barevným indikátorem hypertenze. Chcete doručiť tovar na Slovensko? Prezrite si OMRON M3 s farebným indikátorom hypertenzie. Für Versand nach Österreich, besuchen Sie bitte OMRON M3 mit Bluthochdruck-Farbindikator. Magyarországra történő kiszállításért tekintse meg ezt a termékoldalt: OMRON M3 magas vérnyomást mutató színes kijelzővel.